You want to Go Sober this October and help Macmillan make a real difference to the lives of people facing cancer. And maybe you’re visiting Dry Drinker to get help with this awesome adventure? You want to be a Soberhero but the thought of 31 days of #herbal tea #sparkling water #fruit juice seems a bit …. scary? Well, Dry Drinker has loads of alcohol free sidekicks to help you raise money for Macmillan Cancer. Breaking a regular habit like social drinking for a month is not easy for most people – it can be surprisingly tricky! But it IS possible and there are ways to help yourself succeed. Planning what to drink instead of your usual alcoholic tipple and having it ready to pour is a great way to tackle cravings. At Dry Drinker we’re experts at finding alcohol free drinks that offer grown-up taste, real flavour and the complexity you’d want from an alcoholic drink. We taste test everything before it goes in the UK’s most trusted alcohol free store. Of course, it won’t be the ‘same’ as an alcoholic drink – umm, there isn’t any alcohol and you won’t get tipsy – but you will be amazed at how satisfying and tasty alcohol free can be. Dry Drinker offers a huge choice. Carefully sourced. Safely delivered. No one needs to be left out when it comes to non alcoholic drinks. If you love to raise a toast and celebrate, be assured that alcohol free bubbles are not just fizzy grape juice. Alcohol-free wine making is a serious business, not an afterthought, for winemakers like Torres, Vintense and Ariel. They use the best grapes, ideal growing conditions and modern processes to craft Cabernet Sauvignon, Syrah Rosé, Merlot, Chardonnay, ready for your tasting notes! Or sit back with ice, a slice, and one of the growing number of distilled botanicals on the alcohol free market. They’re very low, or no, calorie too. And you can raise money to support people facing cancer. You superhero. With your help Macmillian can be there for even more people from the moment of their cancer diagnosis, to give practical, emotional and genuinely personal support through cancer, from help with money worries to be there when they need to talk. Services include Macmillan nurses, social workers and family teams, grants to help people pay for transport to hospital, phone service to help people claim the benefits they are entitled to. Find someone to do it with you. You’re stronger when you’re in a gang. Tell everyone, everywhere you’re doing it. Make yourself accountable. Focus on what you can achieve for other people. Your efforts will help Macmillan Cancer make a massive difference to people living with cancer. That’s a great thing to do. Focus on what you are doing for yourself, and how good you will feel when you make 31 days. You deserve to look after yourself and feel good about yourself. Ignore negative comments. Are they jealous? Who knows, who cares! You’re are Going Sober for October because you want to. Full stop. Get your alcohol free alternatives lined up! Dry Drinker Go Sober for October Special Value Box. 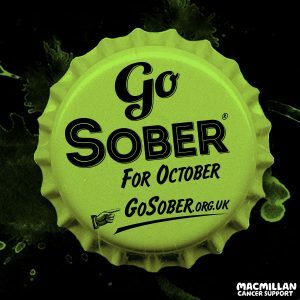 Go Sober for October is a fundraising campaign aimed at challenging social drinkers to change their habits for a month and make some healthy lifestyle changes. We advise heavy drinkers or people dependent on alcohol to speak with their GP before signing up to Go Sober.